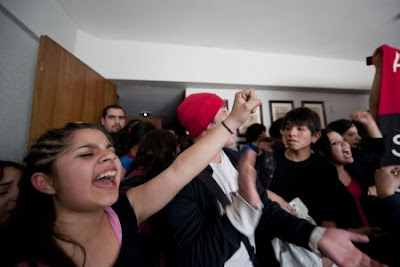 Chilean students occupy ministry bldg. Chile's Education Ministry building, in the capital of Santiago, has been occupied by some 50 students for several hours, before they were forced out by police. The students demanded the resignation of Interior Minister Rodrigo Hinzpeter after the police killed a 16-year old student protester last week, Reuters reported on Wednesday. While no injuries were reported, several windows in the building had been smashed by the students. Meanwhile, the students also expressed their dissatisfaction with a planned dialogue between officials of the government of President Sebastian Pinera and leaders of Confederation of Students of Chile (CONFECH) on Saturday. “The CONFECH is led by political parties and intends to settle the conflict by shaking hands with politicians, while schools that are mobilized on the periphery do not have any say in the decisions,” said a spokeswoman for the occupation group. The planned dialogue was announced by Pinera a day after the 16-year old student had been shot. Hundreds of thousands of students across the country have engaged in more than three months of demonstrations against the Pinera's government. The students have demanded more affordable and better state education. Despite the fact that the Greek academic year has yet to begin, students in universities and polytehnics across the country are already gearing up to resist contoversial reform programme being introduced by minister for education, Anna Diamantopoulou. According to student leaders over 300 department in institutions of higher education nationwide are now being occupied by students unhappy with changes designed to overhaul Greece's ailing universities and technical schools. 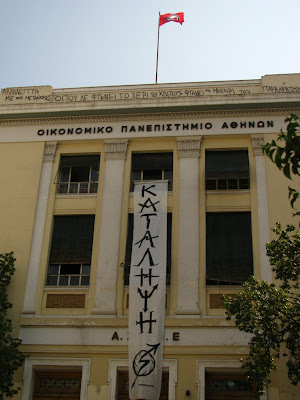 For protesting students and academics the reforms are little more than than a cost cutting exercise being foisted upon Athens by its international creditors anxious to bring public spending down. I’m against the cuts, now what?